Complete esophageal obstruction after (chemo)radiation for head and neck cancers is rare. However, inability to swallow one’s own saliva strongly inflicts upon quality of life. Techniques for endoscopic recanalization in complete obstruction are not well established. We assessed the efficacy and safety of rendezvous recanalization. 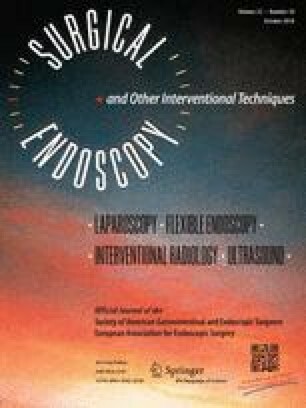 We performed a retrospective review of all patients who underwent endoscopic recanalization of complete proximal esophageal obstruction after radiotherapy between January 2009 and June 2016. Technical success was defined as an ability to pass an endoscope across the recanalized lumen, clinical success by changes in the dysphagia score. Adverse events were recorded prospectively. 19 patients with complete obstruction (dysphagia IV°), all of whom had failed at least one trial of conventional dilatation, underwent recanalization by endoscopic rendezvous, a combined approach through a gastrostomy and perorally under fluoroscopic control. Conscious sedation was used in all patients. In 18/19 patients (94.7%), recanalization was technically successful. In 14/18 patients (77.8%), the post-intervention dysphagia score changed to ≤ II. Three patients had their PEG removed. Factors negatively associated with success were obstruction length of 50 mm; and tumor recurrence for long-term success. No severe complications were recorded. Rendezvous recanalization for complete esophageal obstruction is a reliable and safe method to re-establish luminal patency. Differences between technical and clinical success rates highlight the importance of additional functional factors associated with dysphagia. Given the lack of therapeutic alternatives, rendezvous recanalization is a valid option to improve dysphagia. Stefano Fusco, Thomas Kratt, Cihan Gani, Dietmar Stueker, Daniel Zips, Nisar P. Malek, and Martin Goetz have no conflicts of interest or financial ties to disclose.